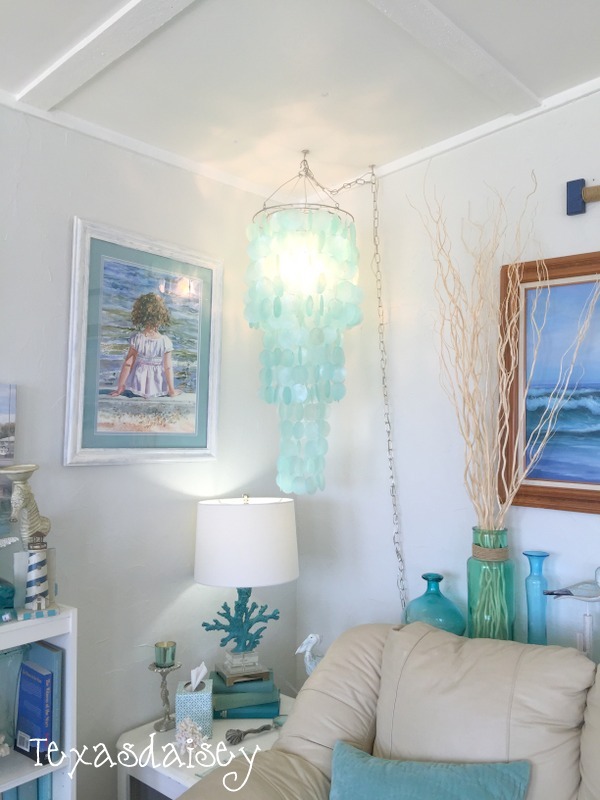 I decided that my beachy themed lakehouse would not be complete without a capiz chandelier but when I began to price them I got sticker shock. They started out about $150 and went up...way up. Being the thrifty gal that I am, I decided I could do better. I found a capiz shell mobile on sale for about $45. I was thrilled. It did not have a light but that could be added. 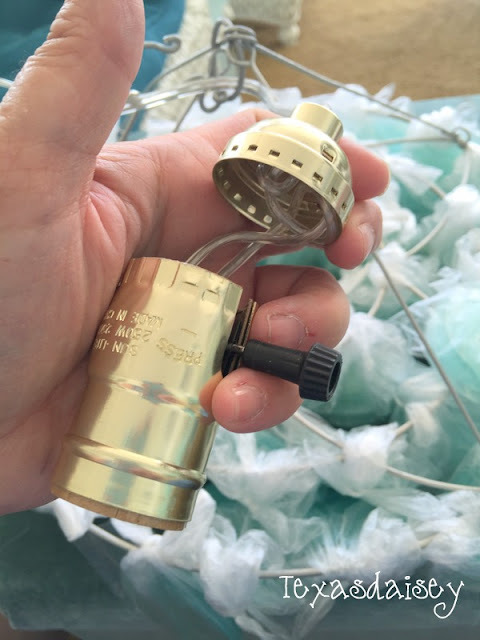 I then purchased a hanging swag kit and a lamp repair kit. Each of those were about $8 each. Everything I needed for a beautiful swag chandelier for less than $60. That is a bargain. I fed the cord that came with the swag kit through the chain. 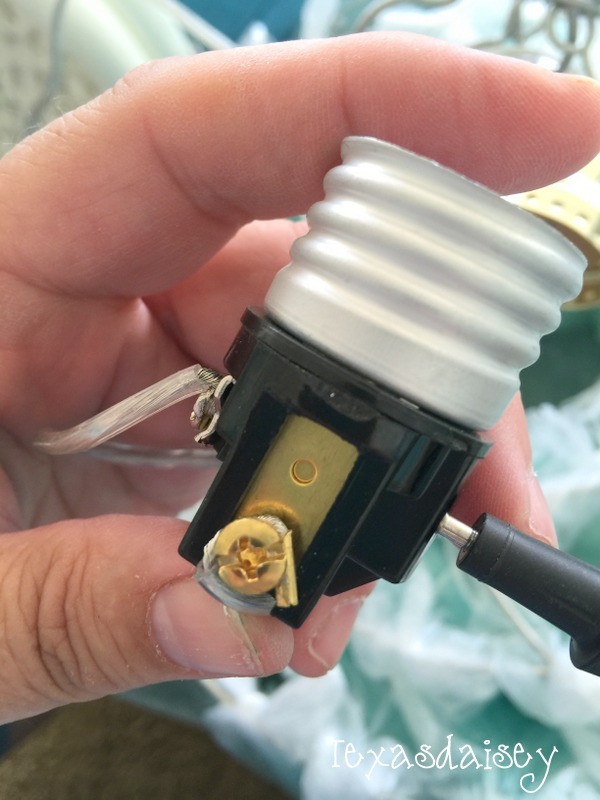 I then strung the bottom of the lamp kit onto the end without the plug. I tied an underwriter's (electrician's) knot. Next I loosened both the silver and brass screws on the switch part. I bent the wire ends around the base of each screw. It doesn't matter which end goes on which screw. I tightened the screws so that the ends were fastened well and would not pull away. 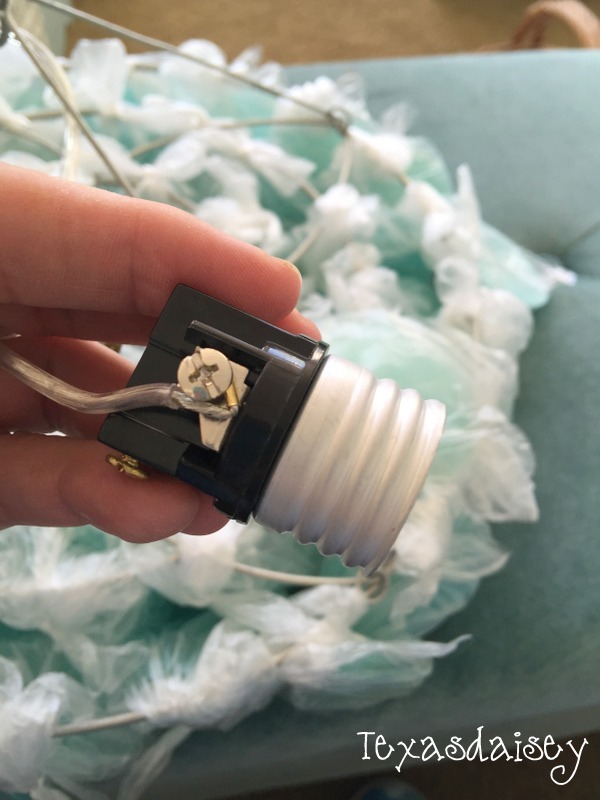 Next, I tucked the knot up into the bottom of the lamp kit and tucked the cover over the switch part. Then I attached the two together. It should snap together. 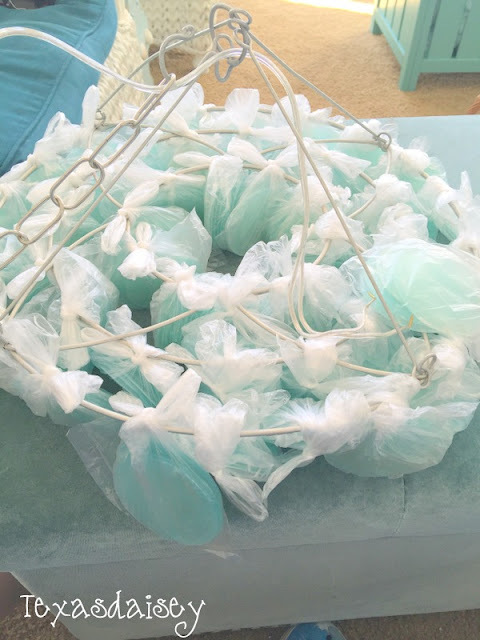 Make sure you have enough cord to allow the light to hang down in the middle of the shells when hanging. It took a bit of adjusting to get it just right. 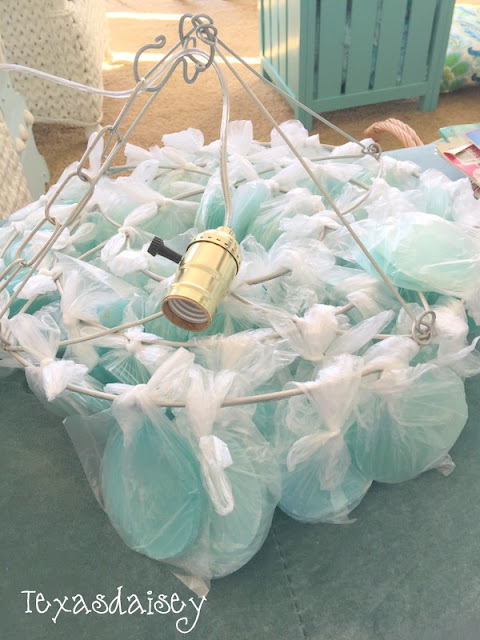 I secured the chain to the hook at the top of the capiz shell mobile and allowed the light to hang free. I then hung the entire thing from a hook in the ceiling on a hook with a molly bolt. I added a second hook closer to the wall. I plugged the light in and it worked! 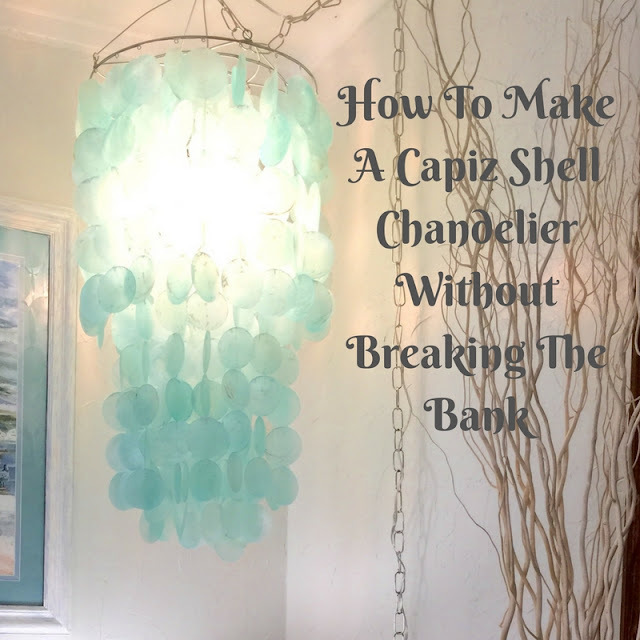 When I unwrapped the capiz shells, I realized they hung much longer than I really wanted them to so I used a hot glue gun and folded the long layer up into the length I desired. I glued the end capiz shell to another one up inside the mobile. My husband added another switch on the cord for me so that I could turn it off and on easier. I am thrilled with how it turned out. If you wanted to make a true chandelier that attaches directly to the ceiling You could easily purchase a kit for that. 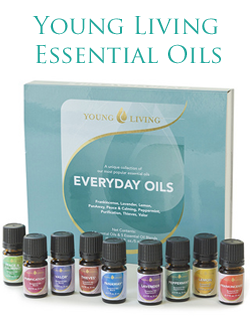 There are all sorts of reasonably priced kits and parts for sale at lumber and hardware stores or even online. 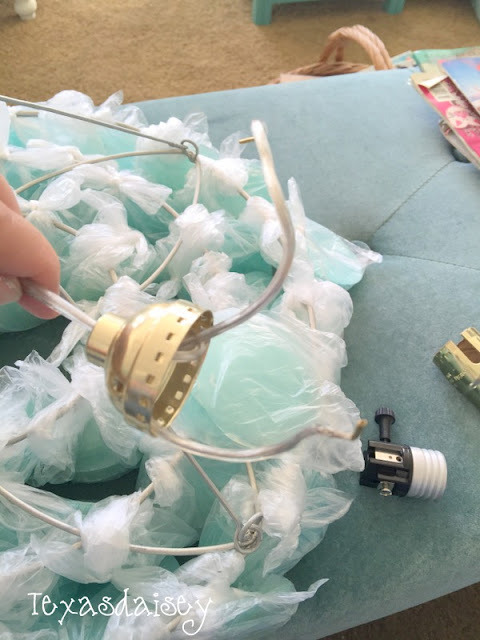 There are also lots of tutorials online that will show you how to wire any kind of light or lamp. Go ahead! Give it a try. You can do it. Wow, that is so beautiful and so perfect for this little home of yours. You did a great job wiring it for a light. You inspire me dear heart. Love your home. Could please tell me where you bought the painting of the little girl at the beach. Love it! I love this idea! Thank you for posting! 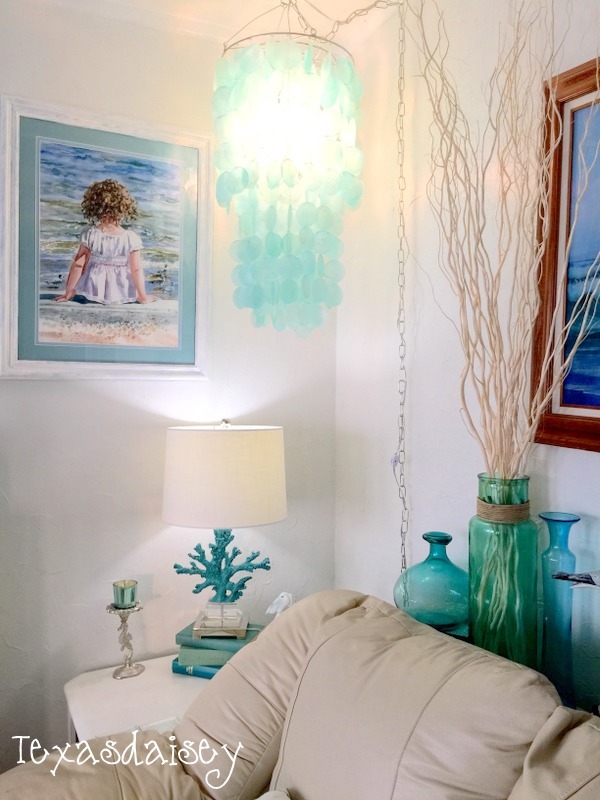 Thank you for sharing your gorgeous lamp! i too have a coastal theme in my home....in Iowa!